With product fulfillment services from eFulfillment Service (EFS), you get the time to run your business, and the technology to make it easy. For over a decade, our in-house IT team has developed and enhanced our proprietary Fulfillment Control Panel (FCP), the web-based fulfillment software at the core of our operations. This software, which we integrate with your shopping cart for free, is accessible 24/7 and provides you with constant visibility over your order fulfillment operations. Our FCP system provides detailed, real-time reporting to provide merchants with an up-to-date overview of their SKU counts, orders, shipments, tracking information and more. Our advanced technology is not only designed to keep our clients up-to-date, it also allows online sellers to customize features so they can keep their customers up-to-date. Below are some of the additional features and benefits of our fulfillment technology. As one of our long-time clients put it….we don’t try to impress you with fancy buttons and animated layouts. We keep our product fulfillment software simple and straightforward, so you have the information you need, when you need it, and it’s presented in a way that makes sense. 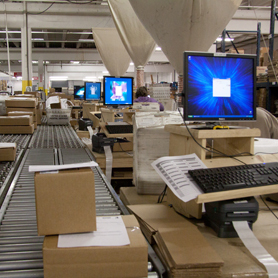 To access our Fulfillment Control Panel, all you need is a computer and an Internet connection. We provide you with a secure login that can be used at any time to check your inventory, orders and shipments. We also provide you with up to date news and alerts to keep your business running smoothly, such as when product inventory is low, or when shipping has been affected to certain areas because of a natural disaster. Our order fulfillment technology also keeps your customers in the loop by automatically sending tracking emails that can be customized by you. These customizable emails allow our clients to add their own personal touch, they can be used to help generate repeat business by including promotional codes, and can also save them additional time by including answers to common questions, such as what the customer should do for returns. Quickly enter single orders, or easily copy and paste your order data from your webstore’s notification e-mails. You can also upload your orders as CSV files. We can even create a custom import format so you can import hundreds of orders from a single file. We integrate with dozens of the most popular shopping carts and eCommerce platforms. That means you don’t have to worry about manually entering orders. It’s automatic. The first step to utilizing our product fulfillment services is to integrate your shopping cart or eCommerce selling platform with our web-based fulfillment software. This integration will allow us to easily receive your orders, then quickly pick, pack and ship them off to your end customers, saving you time while you’re able to monitor everything. Integration is fast and easy, and our experienced in-house technology and customer service teams will guide you through each step of the process. We’re currently integrated with over 30 shopping carts and systems, but if yours isn’t on our shopping cart integrations list, just let us know and we’ll contact your cart provider about connecting it with our fulfillment software. Now for some technology jargon…. What we’re trying to say here, is that your information is highly protected. Our order fulfillment system is fast and secure, and we have off-the-grid power sources for reliable backup protection. In addition, for added protection, you have the option to easily change your password at any time. With order fulfillment technology and services from EFS, you can make your business more flexible and efficient, without sacrificing transparency. Discover why so many online sellers around the world put their trust eFulfillment Service. Request a quote today.